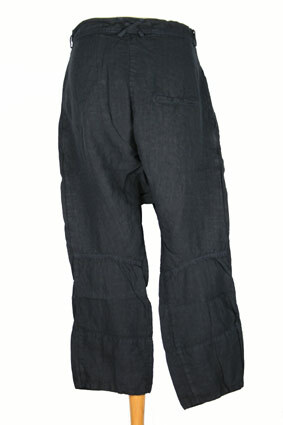 Rundholz Dip Collection over-dyed, linen, low-crotch trousers in Dark Navy colour with cotton attachments. Belt loops (crossed loops at rear) and long buttoned fly with placket. 2 side pockets. On right thigh there is a small pocket (large ticket style) and a patch pocket with flap, unattached at the bottom where the lighter blue cotton inner pocket extends beyond. This pocket has raw edged detail. Single pocket at the rear. Panel construction. These are real special trousers, beautifully designed and with great, tasteful detail. Can be used with a turn-up if required.